Westfield, NJ * Westfield New Jersey * Tower Clock * "Town Clock"
The 1886 E. Howard clock, serial number 1141, which graces the tower of the First United Methodist Church of Westfield, was purchased with funds raised by a fair and dinner on December 16 and 17, 1886. The gala occasion, under the management of Miss Mary E. Mapes, was held in the first Arcanum Hall. 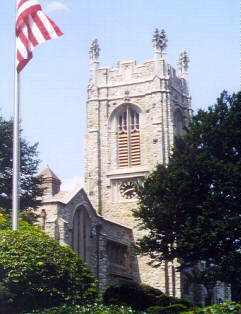 The events were hosted by the "Ladies of Westfield," the First Methodist Episcopal Church as it was known in those days, and with the cooperation of other Westfield churches, merchants, and townsfolk whose desire it was to have a town clock and bell in a central location for all to see and hear. The goal was to raise at least $600.00 - a large sum of money in 1886. The fair and supper were successful and more than enough money was raised to fully endow the 1886 clock fund. The advertisement for and a list of the people who conducted the fair and supper can be seen in a copy of the 1886 Westfield Methodist, a copy of which is available from the clock restorer or from an original in the files of the Westfield Historical Society. The First Methodist Episcopal Church of Westfield, dedicated in 1877. This was the first steeple to hold the 1886 E. Howard Clock and Meneely Bell weighing 2,048 lbs. In 1873, the Methodist Episcopal society of Westfield engaged J. N. Wilcox, a local carpenter and builder, to construct the second church on the present site at 1 East Broad Street. It was built on additional land donated by James R. Ferris and dedicated without the steeple in 1877. The 2,048 lb. bell was furnished in 1886 by Mrs. Mary Burhans, a prominent citizen of Westfield. As the steeple of the church was still unfinished, Mrs. Burhans made an offer to the pastor, the Reverend G. W. Stevens: "If the people would build the steeple, she would present a bell of the best quality weighing not less than 2000 lbs." The offer was accepted and the bell was purchased from the Clinton H. Meneely Bell Co. in Troy, NY. On the morning of October 5, 1886, under the watchful eyes of many passersby, the bell was raised and mounted in the steeple. At 6 PM that evening, with the grounds and streets crowded with carriages and townsfolk whose enthusiasm was at great heights, Mrs. Burhans pulled the rope of the tolling hammer 86 times to commemorate the number of years of her venerable age. The installation of the clock came soon afterwards. The clockworks and four dials were delivered to Westfield on November 29, 1886, and installed shortly thereafter. At that time the clock dials and works were located above the bell. The cost to finish the steeple and purchase the clock and bell was, according to financial records, about $3,000.00. In 1910, ground was broken for construction of the third and present church. In 1911, both clock and bell were moved to the new tower. Today, still controlled by the original clockworks, the clock has only two dials which face south and west respectively. The present building of the First United Methodist Church of Westfield, built in 1910. The clock dials were restored in October, 1993, with the works and dials remaining historically accurate. Please click here to view "before" and "after" photographs. This web page was made possible by . . .
Click below to visit the entire "Westfield, New Jersey" community . . .
© All rights reserved. These pages are provided for informational purposes only. Although we strive for accuracy, we cannot be held responsible for errors or omissions. Editor and Webmaster: Darryl Walker.